At Google I/O 2018, Google Assistant gained the ability to converse more naturally with users Google Assistant Learns New Conversational Skills Google Assistant Learns New Conversational Skills Google is pushing hard to make Assistant the one AI to rule them all. And at Google I/O 2018, the company has announced a number of new features coming to Google Assistant. Read More . Google also announced that Google Assistant was getting six new voices, including John Legend. It has taken longer than expected, but Legend’s voice is finally available. Google is referring to John Legend’s voice as “a cameo”. This is because he hasn’t recorded every single response you might elicit from Google Assistant. Instead, he’ll answer certain questions, with the standard voice still doing the donkey work. These questions include, “Are you John Legend?”, “What’s your favorite type of music?”, “Who is Chrissy Teigen?”, “What’s the temperature outside?”, and “Why is the sky blue?”. You can also ask, “Are we just ordinary people?” and instruct him to “Serenade me”. According to The Keyword, you can enable John Legend’s voice in Google Assistant in two different ways. 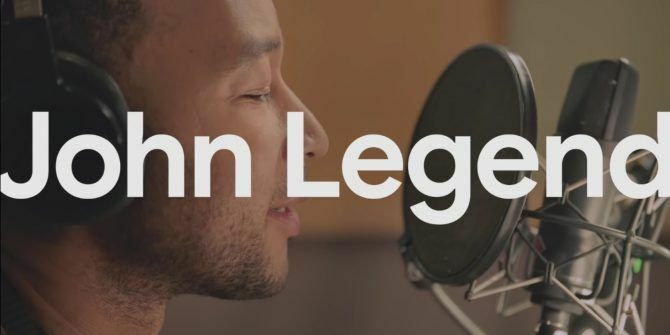 Either say, “Hey Google, talk like a Legend” or go to Settings > Assistant Voice, and select John Legend. This is currently only available in English in the U.S.
What Celebrities Should Google Ask Next? Fans of John Legend will obviously lap this up. And everyone else can rest assured that Google is very likely to be adding more celebrity voices in the future. This may be a novelty, but it’s a novelty most people will appreciate to some degree. If you’re just a little bit obsessed with celebrity but not a fan of John Legend, why not learn how to beat bullies by seeing how celebrities react to mean tweets. Or maybe you would prefer to see how your favorite celebrities can infect you with malware Can Your Favorite Celebrities Infect You With Malware? Can Your Favorite Celebrities Infect You With Malware? Searching for your favorite celebrities seems innocent enough, but online delinquents can use your interest in celebs to target you for malware. Here's how to stay safe when checking up on your favorite stars. Read More . Explore more about: Google, Google Assistant, Voice Commands.